Thank you for your kind words on my Monday from h-e-double-hockey-sticks. Yesterday, as expected, was a much, much better day…great, even! I was running a bit late in the morning (are you seeing a pattern here? I blame Parenthood on the DVR), but still managed to get to campus plenty early. I joined the new gym (Mr. P, too!) near our house and attended a Step and Sculpt class last night. Someone under the age of 30 probably shouldn’t be sooo excited over the thought of step aerobics, but shamelessly, I am (if I didn’t fear the harsh judgements from strangers, I would probably wear leg warmers to class…once I located some). The step portion was a breeze…it was my lack of balance and strength in the second half of the class that had me struggling. You know you had a good workout when the turn of a steering wheel feels like the continuation of the workout. And let’s not even talk about the added effort needed to just wash my hair. Killer workout. And one more piece of good news that I will share…soonish! Promise! So yeah, it took two days, but I’m back in the groove. Five days off can take a toll on a person…seriously. And while Thanksgiving has come and gone, you can’t miss out on some of the joys of the cooler months…like the humble sweet potato. Especially when in the form of fries. Baked, naturally. 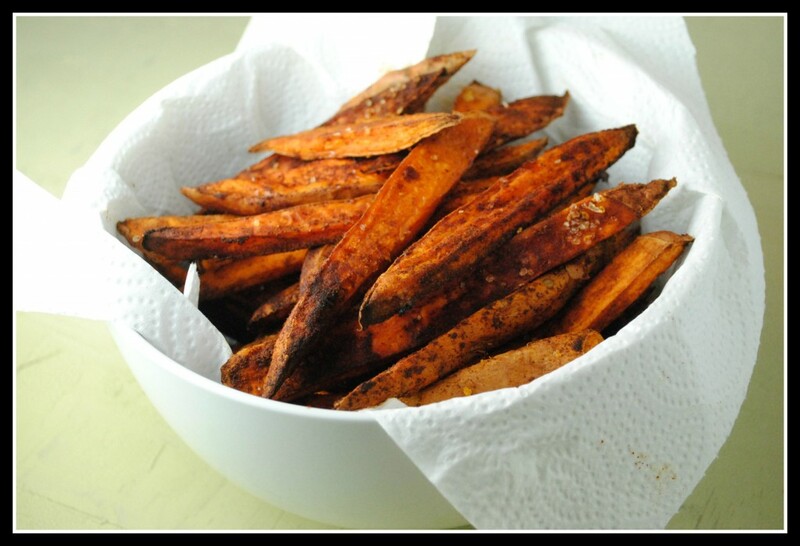 The sweet potato fries were perfectly sweet and spicy with the traditional hint of cinnamon. I’d like to think the cayenne was unique. The salmon was a complete shot in the dark. I was feeling lazy, so I went with equal amounts of honey, dijon, and lemon juice. It worked…really, really well. And rather than a side salad, I slid the salmon filet on a bed of arugula, drizzled the remaining dijon-honey-lemon mixture over the top and…voila. Line a cooking sheet with tin foil and spray with cooking spray. Lay salmon filets, skin side down, on the baking sheet. In a small dish, combine the lemon juice, dijon, and honey. Combine well. Drizzle half of the mixture over the salmon filets, reserving half for later. 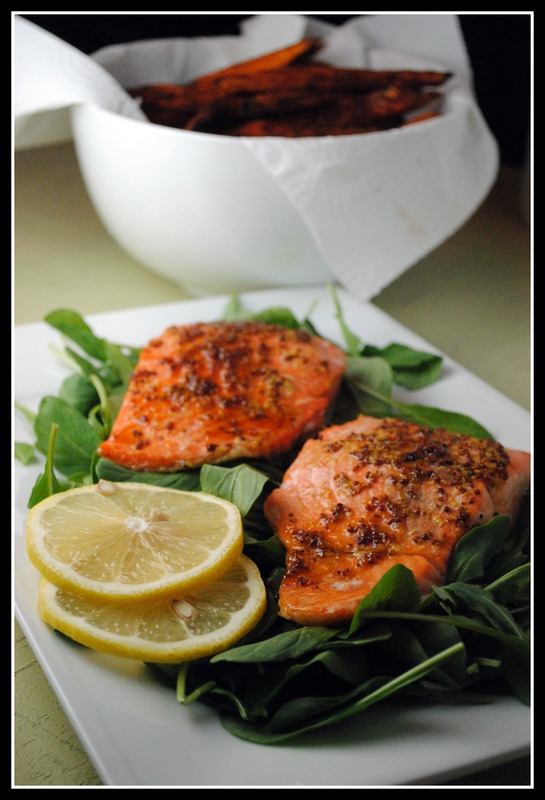 Bake the salmon for 12-15 minutes, or until flaky and cooked through. Meanwhile, arrange the arugula on a small platter. 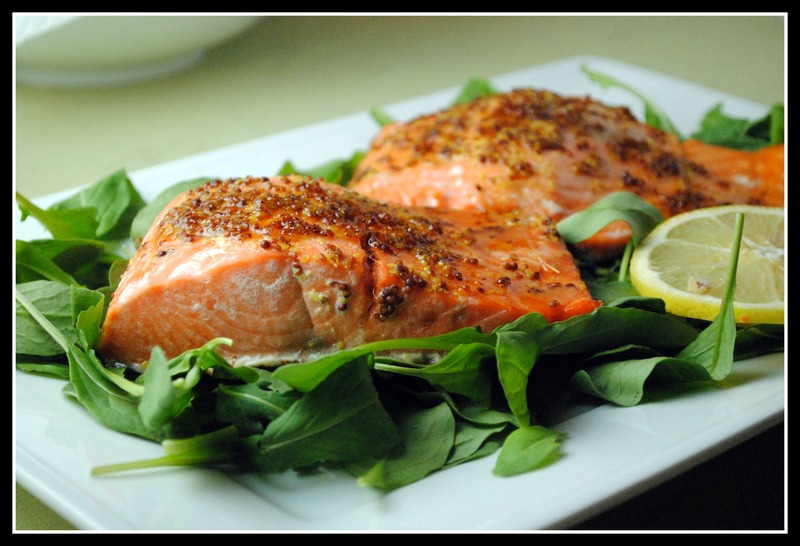 Remove the salmon from the oven and transfer to the bed of arugula on the platter. Drizzle each filet (and arugula, if desired) with the remaining mixture. Serve immediately. Yield: 2 servings. Result: So simple, so good. I always have these ingredients on hand and the flavors balance perfectly. I am always looking for new ways to make salmon and serving this over a bed of arugula that wilts just slightly from the heat of the salmon was perfect (coming from the girl who hates hot, wilted lettuce). Enjoy! Preheat oven to 400 F. Line 2 baking sheets with foil and spray with non-stick cooking spray. Cut potatoes into matchsticks. Toss with the olive oil, and then the seasonings. Arrange potatoes in a single layer on the baking sheets. Bake for 20 minutes. Remove from oven and flip fries to the opposite side. Bake an additional 20 minutes, or until baked to desired crispiness. Yield: 4 servings. Result: Sweet with a bit of spice! The only warning I have with sweet potato fries is that they don’t get quite as crispy as those made with a russet potato. The best thing to do it cut them really thin if you’re looking for a crispy fry. Since I don’t dip my sweet potato fries in anything (i.e. ketchup), I enjoy the texture just fine. 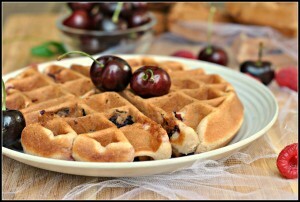 Simple to make and kid and family-friendly! Enjoy! 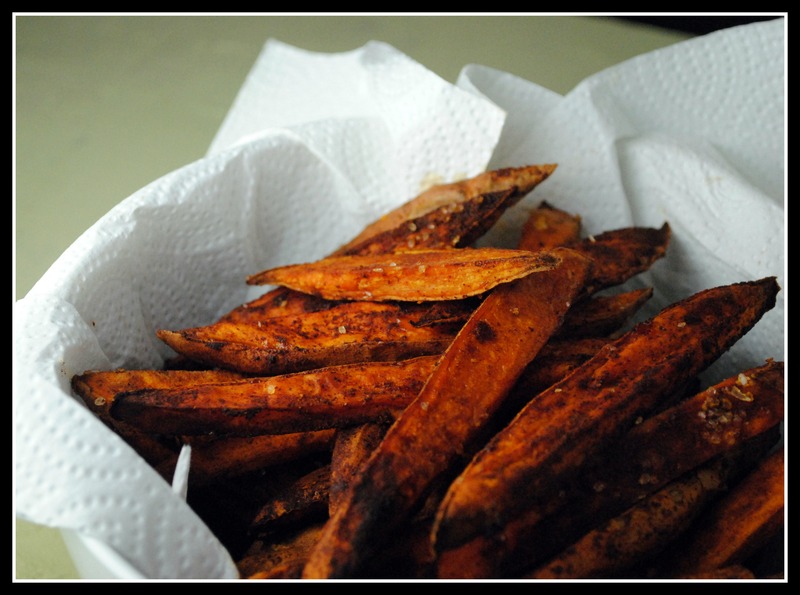 Now, I want some sweet potato fries for breakfast – yum! Oh man… I’d totally rock out the leg warmers!!! I’m yet to do a class at my gym. It’s a little intimidating, given my lack of coordination. Waiting for a time when I can go to the gym and know the classes will be a little lighter (aka the days I took off around christmas break). I always use cinnamon and cayenne on my SP fries. Yours look nice and crispy even if they weren’t! I always feel so uncoordinated when I try my feet out at step aerobics! Maybe I just need to do it more consistently, ha. I totally want to go in a brightly colored leotard and matching sweatband. Looks like I’d love your instincts. Salmon and sweet potatoes is one of my favorite combos, and I love a good dijon marinade! I have never been a big salmon fan, but this picture makes me want to try again! Glad your week is turning up! Maybe you can keep me inspired until Saturday and I’ll start my muay Thai back up. It does feel so good to have a challenging workout! This is my idea of a perfect meal! 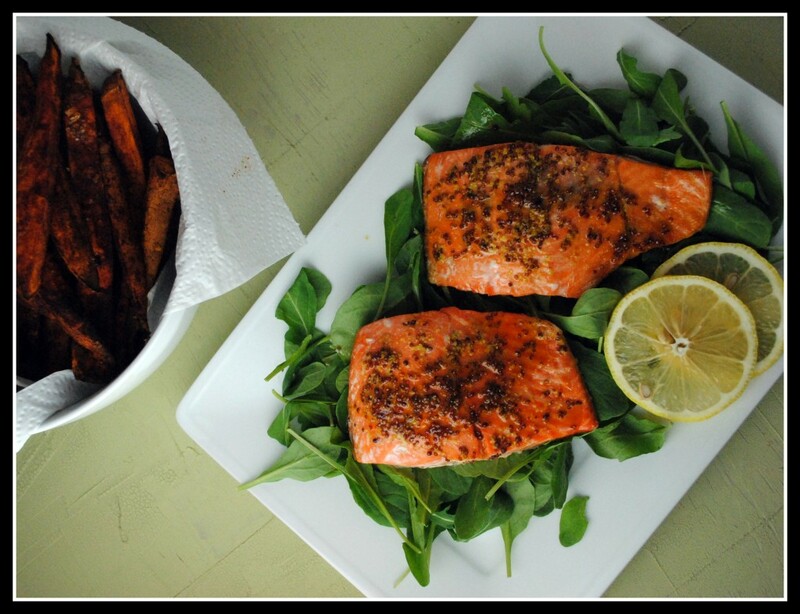 Salmon + arugula + sweet potato… yum! I love step class too! I took it for a while last winter to change things up. It actually helped maintain my running even though I didn’t put in many miles over the winter. I made this last night and it was amazing! I loved the honey/lemon/mustard flavors together. My husband doesn’t love sweet potatoes but thought the oven fries were pretty good. I will definitely be making this again and again and again!! I’m going to use honey/lemon/mustard mixture as a salad dressing too. I’m so glad you liked it! 🙂 I think that lemon juice/honey/dijon can work on SO many things. 🙂 Thanks for your feedback! And, HAPPY WEEKEND!!!! head up: H&M carries leg warmers. This dinner looks just incredible. For some reason, I order fish when eating out but don’t feel that comfortable cooking it at home. 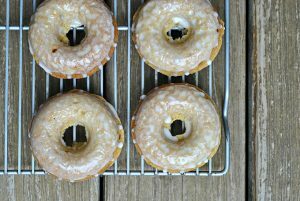 This recipe looks like a simple one I could master. Dont you just love/hate those workouts that leave you in so much pain, even simple tasks hurt!!! I have leg warmer and LOVE them! I wear them in my house all the time 🙂 maybe I’ll get silly sometime and wear them when I teach :). Can’t wait to hear your exciting news! Great looking meal. This is definitely one I need to try in the future (when Ryan is not on night shift). Hope things are going a little more smoothly. I agree those long weekends can through things off when you try and get back into the routine when it ends. One thing I love about vacations is that we walk. Ryan and I walk where ever we can so that helps. In fact, while in Tokyo this past weekend I must have been doing more stairs or hills than usual because I woke up one morning and was really sore. I was a little pleased actually. But I know it is different when visiting home for holidays because then there is never time to fit in workouts, at least I never find time. But regular vacations turn in to a walking fest for us.